The LDC1612 and LDC1614 are 2- and 4-channel, 28-bit inductance to	digital converters (LDCs) for inductive sensing solutions. With multiple channels and support for	remote sensing, the LDC1612 and LDC1614 enable the performance and reliability benefits of	inductive sensing to be realized at minimal cost and power. The products are easy to use, only	requiring that the sensor frequency be within 1 kHz and 10 MHz to begin sensing. The wide 1 kHz to	10 MHz sensor frequency range also enables use of very small PCB coils, further reducing sensing	solution cost and size. The high resolution channels allow for a much larger sensing range,	maintaining good performance beyond two coil diameters. Well-matched channels allow for	differential and ratiometric measurements, which enable designers to use one channel to compensate	their sensing for environmental and aging conditions such as temperature, humidity, and mechanical	drift. Given their ease of use, low power, and low system cost these products	enable designers to greatly improve performance, reliability, and flexibility over existing sensing	solutions and to introduce brand new sensing capabilities to products in all markets, especially	consumer and industrial applications. These devices are easily configured via an I2C interface. The	two-channel LDC1612 is available in a WSON-12 package and the four-channel LDC1614 is available in	a WQFN-16 package. 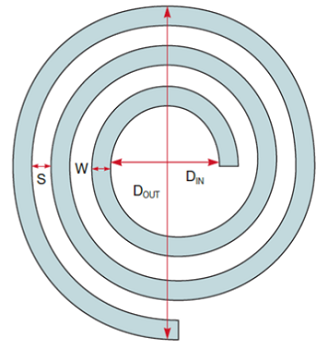 Use this tool to get started with inductive sensing coil design. Use this tool for building custom sensor coils with known system constraints. What are TI Design tools?